Many skydiving centers have jumpsuits you can rent for your jump. Whether you're a thrill-seeker chasing that next adrenaline rush, or just want to cross another item off your bucket list, you've decided to go skydiving. You'll be jumping out of a plane and free falling for between 45 and 60 seconds at 110 mph before pulling the ripcord to release your parachute so you drift safely to ground. While there's no uniform for this thrilling pursuit, instructors suggest you wear tennis shoes and a loose-fitting shirt and pants when you go skydiving. Ideally, the clothing you wear will cover your torso, arms and legs. Skydiving instructors often recommend their students wear long pants and long sleeves. The temperature in the air at jump altitude typically is about 30 degrees cooler than the temperature on the ground. Even if it's a hot summer day, this temperature difference could make your time in the sky less enjoyable. Additionally, since you may slide to the ground on landing, long pants will protect your legs from getting scraped up. Shirts with collars can also cause discomfort or injury because the collar will blow up and beat against your neck. Since you don't want to lose a shoe in the air, skydiving centers forbid slip-on shoes like loafers. Additionally, shoes with open toes or heels can prove hazardous when landing. Sneakers or other light shoes that you can lace up tightly are best to wear on your jump. Although you may have seen photos of military parachutists wearing tall, heavy boots, they aren't necessary for recreational jumps and can cause injury, especially if you're doing a tandem jump with an instructor. If you have any jewelry or accessories, including rings or watches, that you don't want to lose, you should leave them at home when you go skydiving. Most skydiving centers provide helmets, but if you have long hair you might consider pulling it back or tucking it inside the helmet to keep it out of your face during your jump. You'll also be given goggles to protect your eyes from the wind. If you wear glasses and don't want to jump without them, don't worry -- the goggles typically will fit over them. 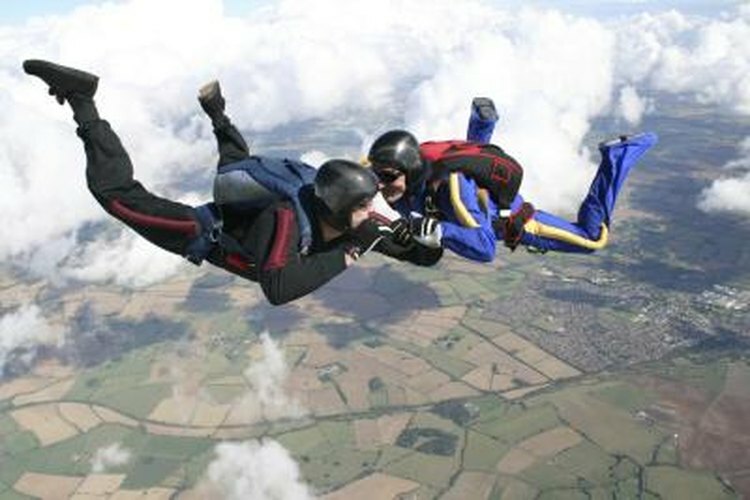 In all but the most northern parts of the United States, you can go skydiving year-round. However, skydiving in colder weather requires a few more layers of clothing. You don't want to wear anything bulky that restricts your movement, but several layers can provide insulation. In winter, a layer of thermal underwear underneath clothes and an extra sweatshirt or fleece jacket help you maintain your body temperature while in the sky. Gloves that aren't bulky enough to inhibit dexterity will keep the blood circulating through your hands.